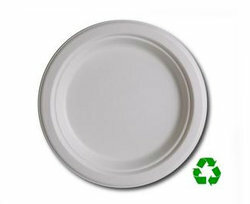 Eco Friendly 6" Plates (50 Count). Our line of sugarcane plates are 100% biodegradable. Use for breakrooms, birthday parties or whenever convenience and easy clean is desired. After use, simply toss them in the trash and feel good knowing that these plates will naturally biodegrade. Made from 100% sugarcane. 100% Biodegradable made from sugarcane. Easy Way to Lower Your Environmental Footprint!